Christian Christmas cards are sometime difficult to find. But you can make your own Christian Christmas greeting cards just by using Christian clip arts and adding Christian Christmas verses to your homemade Christmas cards. Clip arts to use for these Christian Christmas greeting cards are angels, the three wise men, music sheet for any of the Christian Christmas carols, Mary and Joseph in the manger with baby Jesus, shepherds tending their sheep, a dove and other Christian images. You can also use contemporary Christmas clip arts; for example, snowmen, Christmas tree, snowflakes and Christmas ornaments. But you'll need to add a Scripture verse that is related to the Christmas season. You will also like to use 'Blessed Christmas' instead of 'Merry Christmas' and also remember not to shorten the word 'Christmas' to 'X-mas'. Here are two Christian Christmas cards I made for my Christian friends. click here to view a bigger image of this Christmas greeting card. This is a card with a Christian verse - "For unto us this day, a child is born which is Christ the LORD." This is taken from the New Testament - the words of the angel to the shepherds about the birth of Christ. I first printed the words on white cardstock. The two Christmas ornaments were drawn in using my Pigma Micron 005 pen. I then masked the ornament on the extreme left. 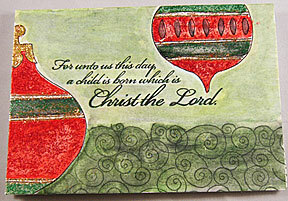 Then stamped the border rubber stamp, named 'Scroll Pattern' by Penny Black on the bottom of the card over the masked ornament so that it will not print on the ornament image. Notes: Masks can be made by tracing the outline of the image on a yellow sticky paper. After tracing, just trim around the outline and you can use the mask again and again. This is especially useful for rubber stamped images. Skip the tracing part when using rubber stamps. After removing the mask, I painted the card with watercolor using mostly green and red colors. Finally, a touch of glitter glue was applied on the Christmas ornaments. 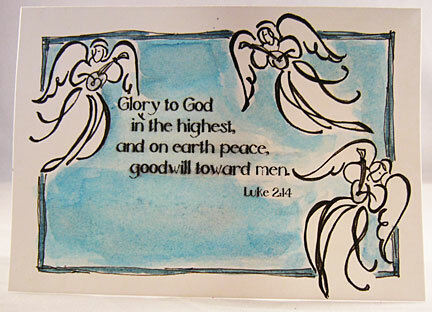 This Christian Christmas greeting card uses another part of the same Scripture passage. This was the praises offered unto God by the multitude of the Heavenly host after the angel had given the Christmas message to the shepherds. Imagine, this whole scene was witnessed by the humble shepherds. 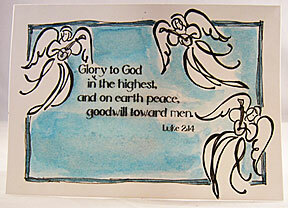 Click here to read the instructions for this angel Christmas card - another of the two Christian Christmas cards.